The Ford EcoSport is basically the Ford Fiesta of the company's crossover lineup in Brazil, Thailand, and India where it's built. 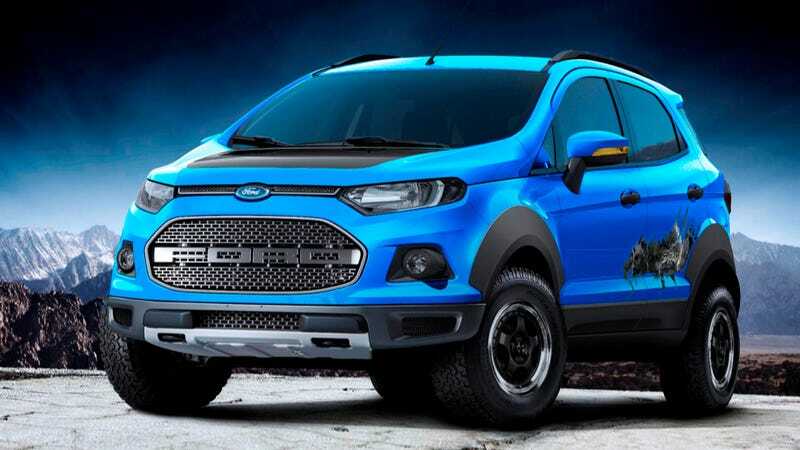 So to give it a little more puxa and I guess "because hilarious," they slapped a Ford Raptor face on one and dubbed it EcoSport Storm. This compact crossover, trotted out for the Sao Paulo Motor Show, has the semi-iconic "FORD"-stamp grille and front bumper from the Raptor, fender flares, 215/75 R15 off-road tires, and some funky rear-quarter graphics slapped over a lovely "Blue Storm" paint job. After (probably) trying really hard to complete the conversion and shoehorn the 6.2 V8 in, Ford gave up and stuck whichever three or four-cylinder fuel-sipper the EcoSport ships with normally. It's fun to laugh at this little thing, but without the graphics it might actually look pretty reasonable... Renegade Trailhawk rival perhaps?